In 1936 the Du Pont chemical company introduced their new product, a plastic made of resin and acrylic, called Lucite. One of the most exciting things about Lucite was that it could be clear and transparent, tinted and transparent, or opaque. It could be made in vibrant colors. Because it could be carved and could encompass small items like rhinestones, it was used for jewelry and ornaments, like this carved bar pin and flowered bangle. 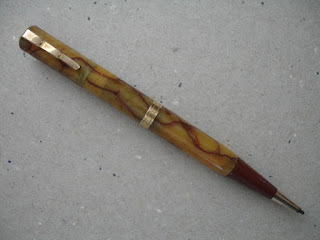 Introduced for Christmas of 1939, Waterman pens and pencils were also made of the new Lucite. To mark their departure from the old celluloid lines, Waterman's also boasted that the new pens would last a century! 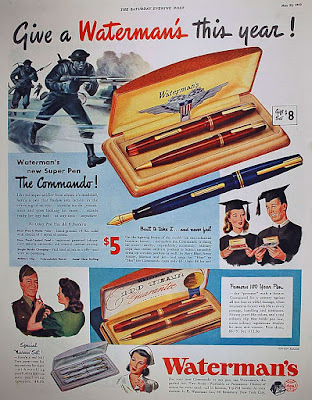 They were called 100 Year pens (and pencils), "a Sensational New Pen. . . made of one of the most amazing materials ever to come out of a test tube." They were offered in transparent red, green, blue, and opaque black. Pens cost $8.50, or a pen & pencil set was $12.25. In September of 1939 war began in Europe, and by early December of 1941, the US was also at war. For Christmas of 1941, Waterman's returned their pen and pencil material to celluloid, allowing the acrylic blend, Lucite, to be used for airplane windshields, bomber noses, and periscopes for submarines. New colors were offered, maroon and amber, as well as blue, green, and black. Unfortunately, the wartime celluloid was not as sturdily made, and many celluloid pens and pencils sustained damage from UV light and moisture, two things which can deteriorate celluloid. The 1939 version of the Waterman 100 Year had a ribbed case. This cap had the so-called "amber end," which was transparent. It served no purpose, except to show off the new material, Lucite. It looks like a repeater, but it is a twist pencil. The clip is unmarked; the imprint is on the back: Waterman's, United States of America. It had a wide enough band to be personalized with engraved name or initials. It is smaller (4 & 1/2 inches) than the later 100 Year (5 & 1/8"), and uses the thinner lead introduced in 1938. One innovation the 100 Year instruments displayed was a "modern" clip design in which the clip began right at the top of the cap. Below is the smooth-case 100 Year, now with the brand name on the clip. This is the war-time model of 1941. This style clip was already in use for Waterman's Lady Patricia and the Lady Thorobred pencils. Interestingly, the clip suited military regulations for pens or pencils carried in uniform pockets: they must never show below the pocket flap or cause the flap to bulge upward. They must be perfectly concealed. 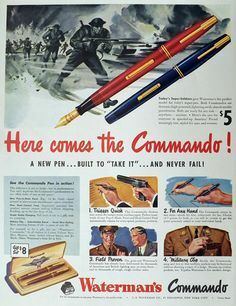 The less expensive line of Watermans, the Commando, available at the same time as the 100 Year, also used this clip, which came to be known as the "military clip."